Home Business What happened to the locavore movement? This may be all well and good but the issue I have is that they’re based out of Birmingham. It’s not that there is anything wrong with Birmingham, or Atlanta for that matter, but there are huge sums of public money going into The Banks development. These tax dollars should be spent in the taxpayer’s best interest, and with unemployment hovering around 10 percent, we should be demanding that these contracts be awarded to local companies who will be employing Cincinnatians. The Banks development plan – rendering provided. It’s much like the rationale behind shopping local. When you award contracts to local companies they’ll hire people in the region, those people will take that money and upkeep their homes, go shopping, eat out, and support the local economy. When we give these contracts away to someone else there goes much of that money. 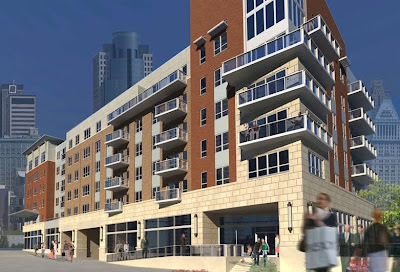 Phase 1A of The Banks development – rendering provided. Brasfield & Gorrie is expected to start assembling their team on site almost immediately and will begin construction on the overbuild of Phase 1A in December with a set completion date of Spring 2011. Once complete, The Banks will represent a total private investment around $600 million. Paul Brown Stadium, Great American Ball Park, the National Underground Railroad Freedom Center, Riverfront Transit Center are all complete and part of Cincinnati’s Riverfront Master Plan developed by Urban Design Associates. The Central Riverfront Park is under construction now and will compliment the entire development.